Of course, much of this had to do with the Fantastic Four’s cinematic rights residing over at Fox, thus forcing Marvel to cut off its own nose to spite its face. Actually, even the X-Men were on the outs for a time, but some justification can be made for cancelling Fantastic Four books because they weren’t selling as well – and there was also word on the street that the publisher wanted to distance itself from the 2015 box office bomb. But now that mutants are once again big business in the comic book medium, things may turn around for those who called the Baxter Building home as well. In fact, they’ve now been given a makeover of sorts in the pages of Marvel Two-in-One #4. 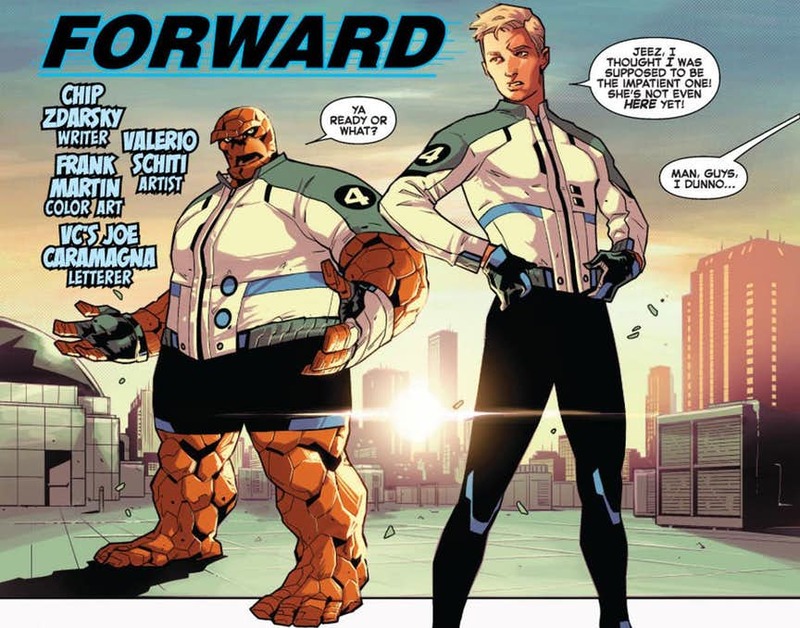 As you can see, Ben Grimm and Johnny Storm are sporting some new duds that force one to recall the Future Foundation costumes from a few years back. Not only that, but a “4” can be seen proudly on display on their sleeves, igniting hope that a full-on reunion will soon be in the cards. Actually, Ben believes that Reed and Sue Richards are dead, and elects to keep that information from Johnny, lest he break his heart. In truth, the Richards are off rebuilding the multiverse with their children, something we’ve all done once or twice on a lazy Sunday. For more on the Fantastic Four‘s latest adventures (well, two of them, at least), be sure to pick up a copy of Marvel Two-in-One, which is now available in comic shops.